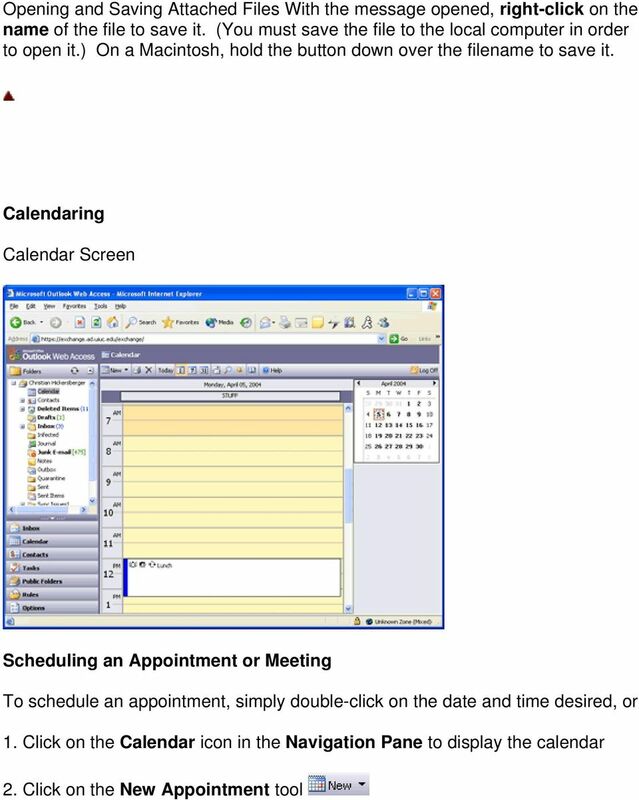 Download "Connecting to LUA s webmail"
3 Allows scheduling of appointments and meetings Enables personal address book creation and manipulation Provides sortable to-do list Allows access to collaborative folders Created automated message handing rules Set various options for messaging, appearance, recover deleted items, and use the Out of Office Assistant Contacts Contacts is Outlook's address book. To create a Contact: 1. Click on the Contacts icon in the Navigation Pane 2. 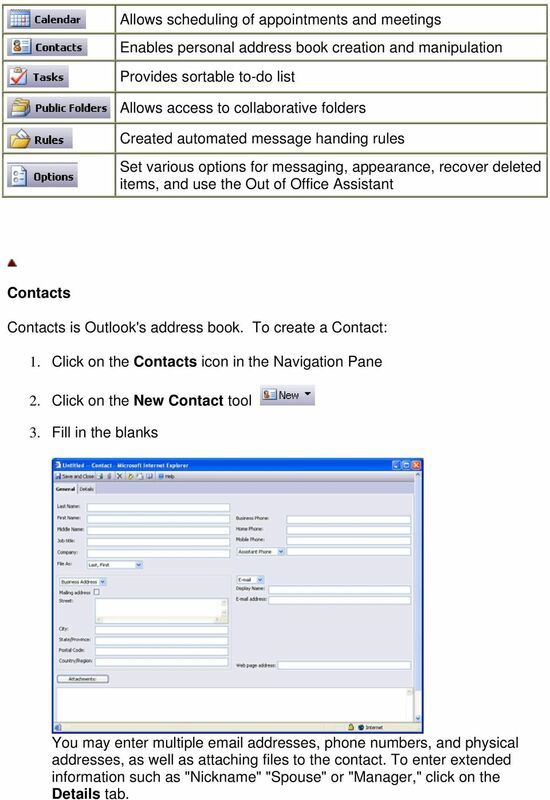 Click on the New Contact tool 3. Fill in the blanks You may enter multiple addresses, phone numbers, and physical addresses, as well as attaching files to the contact. To enter extended information such as "Nickname" "Spouse" or "Manager," click on the Details tab. 4 4. 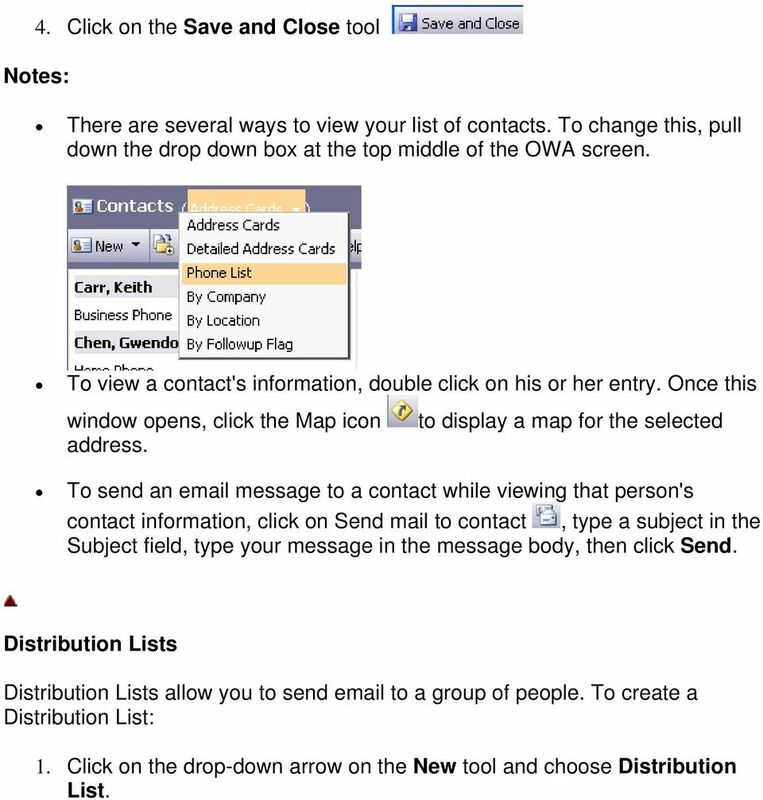 Click on the Save and Close tool Notes: There are several ways to view your list of contacts. To change this, pull down the drop down box at the top middle of the OWA screen. To view a contact's information, double click on his or her entry. Once this window opens, click the Map icon to display a map for the selected address. 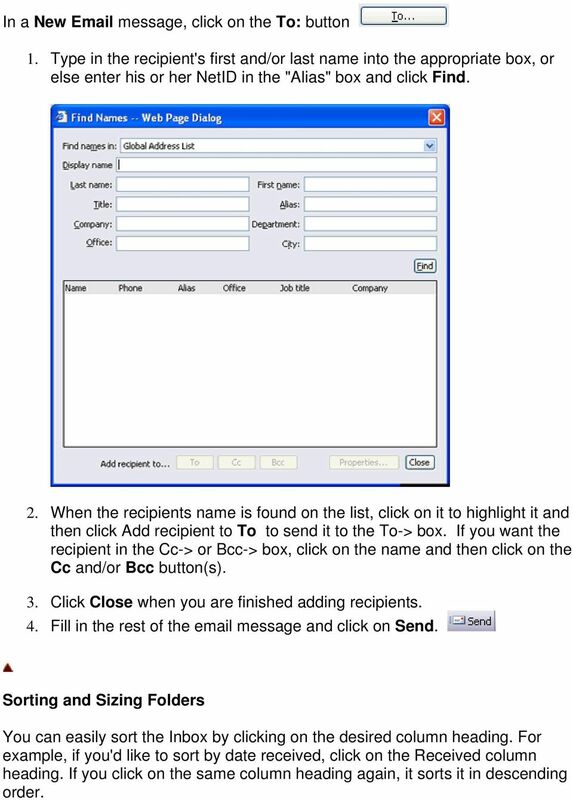 To send an message to a contact while viewing that person's contact information, click on Send mail to contact, type a subject in the Subject field, type your message in the message body, then click Send. Distribution Lists Distribution Lists allow you to send to a group of people. To create a Distribution List: 1. Click on the drop-down arrow on the New tool and choose Distribution List. 6 In a New message, click on the To: button 1. Type in the recipient's first and/or last name into the appropriate box, or else enter his or her NetID in the "Alias" box and click Find. 2. When the recipients name is found on the list, click on it to highlight it and then click Add recipient to To to send it to the To-> box. If you want the recipient in the Cc-> or Bcc-> box, click on the name and then click on the Cc and/or Bcc button(s). 3. Click Close when you are finished adding recipients. 4. Fill in the rest of the message and click on Send. Sorting and Sizing Folders You can easily sort the Inbox by clicking on the desired column heading. For example, if you'd like to sort by date received, click on the Received column heading. If you click on the same column heading again, it sorts it in descending order. 7 Size the columns by pointing to the right edge of the column heading. When the mouse pointer changed to the double arrow, click and drag or double-click to best fit. Setting Message Options To set options in a new 1. Click on the Options tool 2. Change the desired settings and click on the Close button Attachments NOTE: As you are no doubt aware, the Internet is constantly being flooded with worms and viruses. Certain attachment types are frequently indicative of malicious content; the CITES Exchange Services filters these attachments. 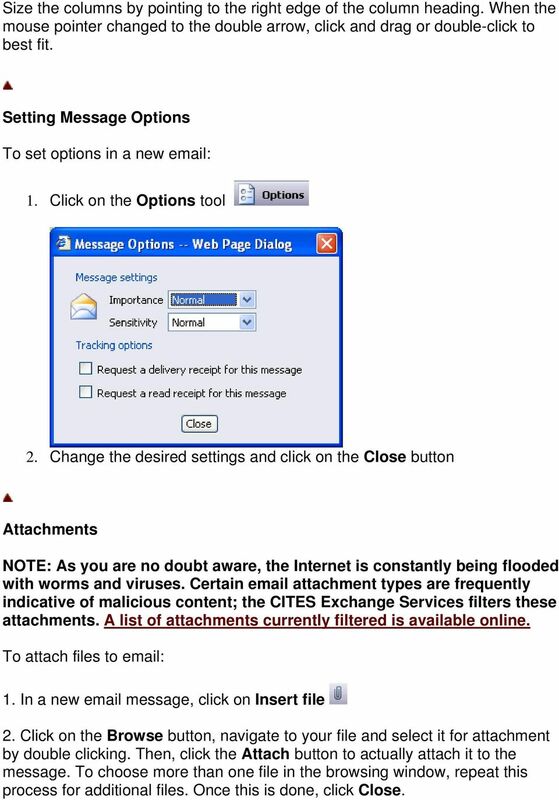 A list of attachments currently filtered is available online. To attach files to 1. In a new message, click on Insert file 2. Click on the Browse button, navigate to your file and select it for attachment by double clicking. Then, click the Attach button to actually attach it to the message. To choose more than one file in the browsing window, repeat this process for additional files. Once this is done, click Close. 9 3. Fill in the blanks 4. If you choose All Day Event, the Event is displayed at the top of the day of the calendar 5. 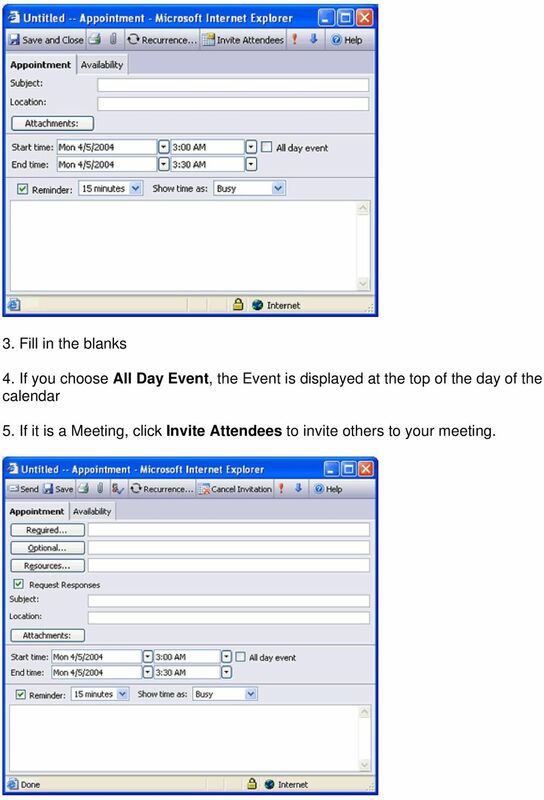 If it is a Meeting, click Invite Attendees to invite others to your meeting. 10 6. You can click on Required to select required attendees or Optional for those who are not required. Selecting attendees is similar to selecting To: or CC: recipients when sending mail. 7. Click on the Availability tab to check that your meeting time fits in the schedules of all your attendees. 8. 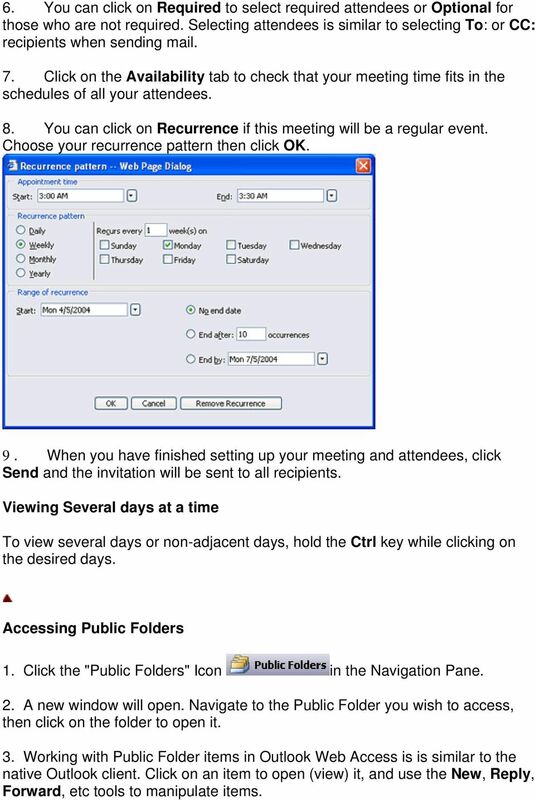 You can click on Recurrence if this meeting will be a regular event. Choose your recurrence pattern then click OK. 9. When you have finished setting up your meeting and attendees, click Send and the invitation will be sent to all recipients. Viewing Several days at a time To view several days or non-adjacent days, hold the Ctrl key while clicking on the desired days. Accessing Public Folders 1. Click the "Public Folders" Icon in the Navigation Pane. 2. A new window will open. Navigate to the Public Folder you wish to access, then click on the folder to open it. 3. 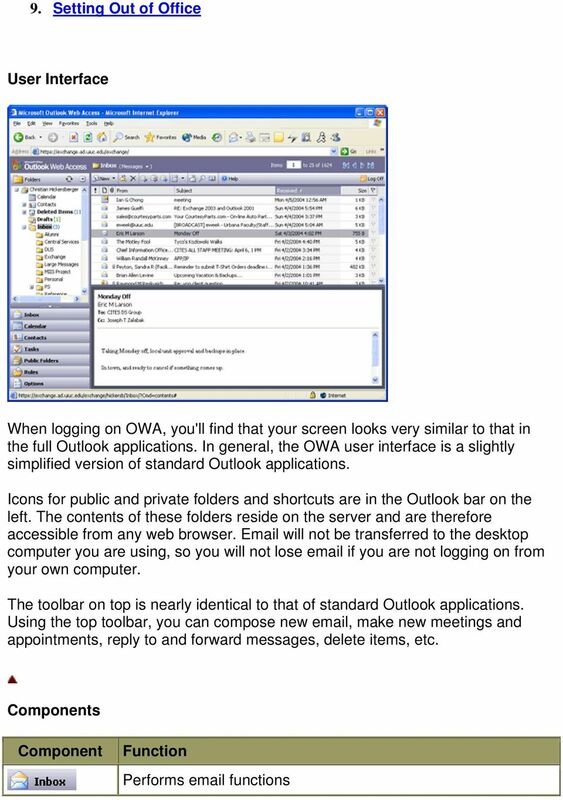 Working with Public Folder items in Outlook Web Access is is similar to the native Outlook client. Click on an item to open (view) it, and use the New, Reply, Forward, etc tools to manipulate items. 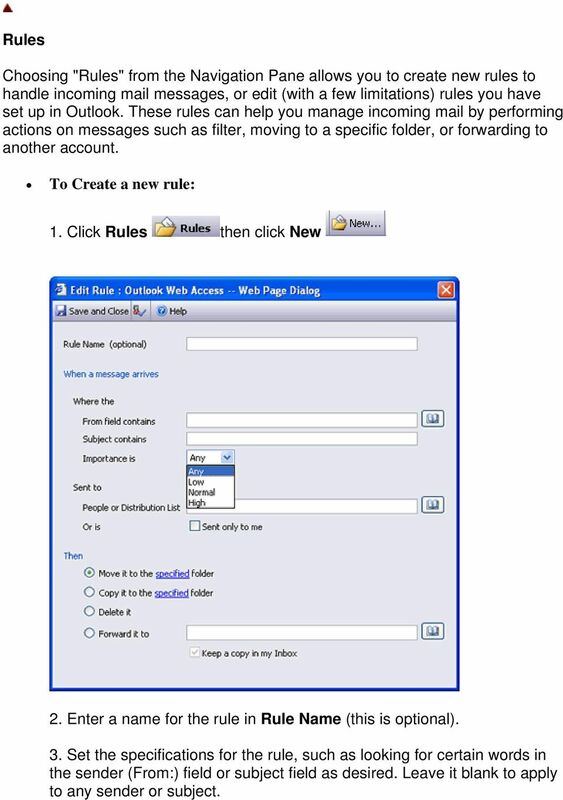 11 Rules Choosing "Rules" from the Navigation Pane allows you to create new rules to handle incoming mail messages, or edit (with a few limitations) rules you have set up in Outlook. These rules can help you manage incoming mail by performing actions on messages such as filter, moving to a specific folder, or forwarding to another account. To Create a new rule: 1. Click Rules then click New 2. Enter a name for the rule in Rule Name (this is optional). 3. Set the specifications for the rule, such as looking for certain words in the sender (From:) field or subject field as desired. Leave it blank to apply to any sender or subject. 12 4. In the Sent To area, select the people or distribution list that the s you wish to apply the rule on were sent to. Again, leave it blank to allow the rule to apply to any message. 5. Then, select the action the rule should perform. 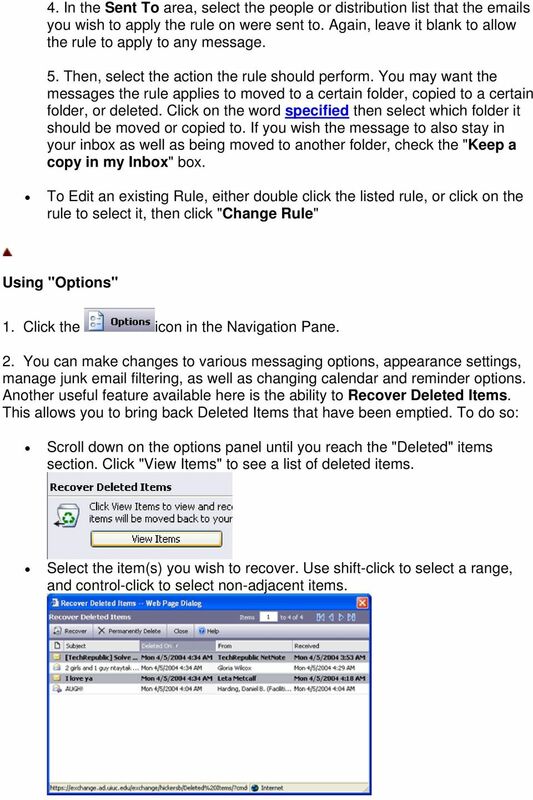 You may want the messages the rule applies to moved to a certain folder, copied to a certain folder, or deleted. Click on the word specified then select which folder it should be moved or copied to. If you wish the message to also stay in your inbox as well as being moved to another folder, check the "Keep a copy in my Inbox" box. To Edit an existing Rule, either double click the listed rule, or click on the rule to select it, then click "Change Rule" Using "Options" 1. Click the icon in the Navigation Pane. 2. You can make changes to various messaging options, appearance settings, manage junk filtering, as well as changing calendar and reminder options. Another useful feature available here is the ability to Recover Deleted Items. This allows you to bring back Deleted Items that have been emptied. To do so: Scroll down on the options panel until you reach the "Deleted" items section. Click "View Items" to see a list of deleted items. Select the item(s) you wish to recover. Use shift-click to select a range, and control-click to select non-adjacent items. 13 Click the Recover button to bring the message back to the Deleted Items folder. Click the Close button when you are finished. You may now navigate to the Deleted Items folder and then drag your recovered message(s) back to the appropriate folder. 3. When you are finished modifying options, click to return to the Inbox. Setting Out of Office Message 1. Choose menu 2. Click "I'm currently out of the office" 3. Enter text in the AutoReply box. The message you enter here will be sent to each sender only once. 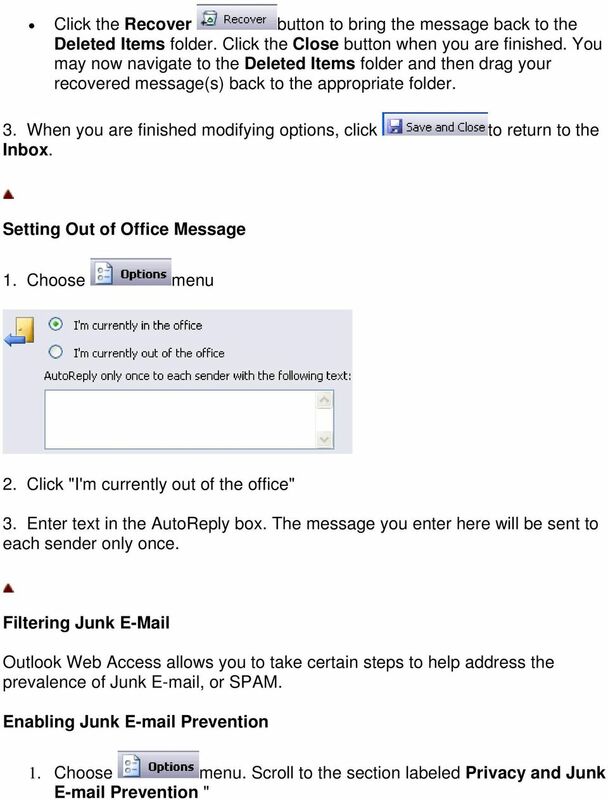 Filtering Junk Outlook Web Access allows you to take certain steps to help address the prevalence of Junk , or SPAM. Enabling Junk Prevention 1. Choose menu. Scroll to the section labeled Privacy and Junk Prevention "
14 2. Check the "Filter Junk " box. This will move messages believe to be spam to the Junk folder. You may wish to check this folder from time to time to ensure that no legitimate messages have been marked as junk. 3. 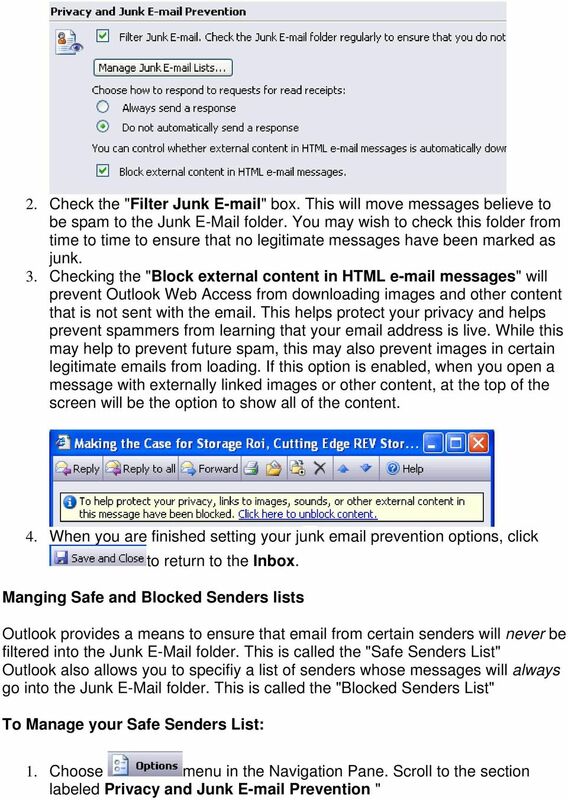 Checking the "Block external content in HTML messages" will prevent Outlook Web Access from downloading images and other content that is not sent with the . This helps protect your privacy and helps prevent spammers from learning that your address is live. While this may help to prevent future spam, this may also prevent images in certain legitimate s from loading. If this option is enabled, when you open a message with externally linked images or other content, at the top of the screen will be the option to show all of the content. 4. 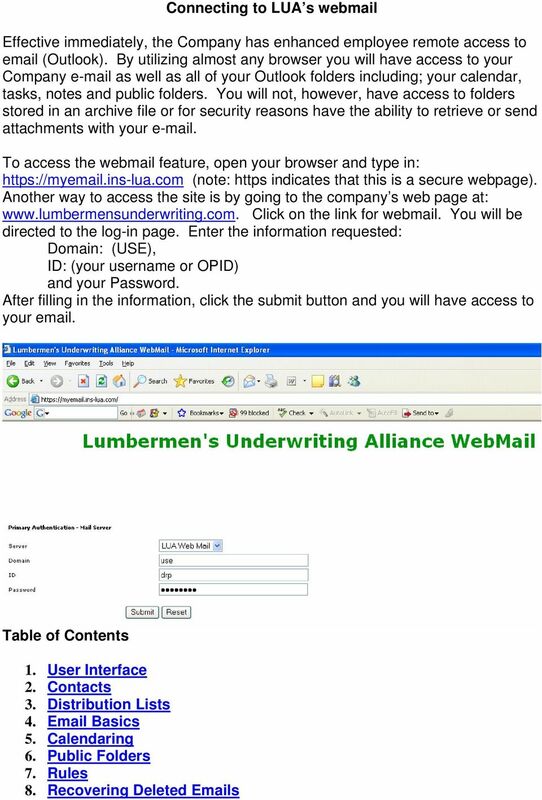 When you are finished setting your junk prevention options, click to return to the Inbox. 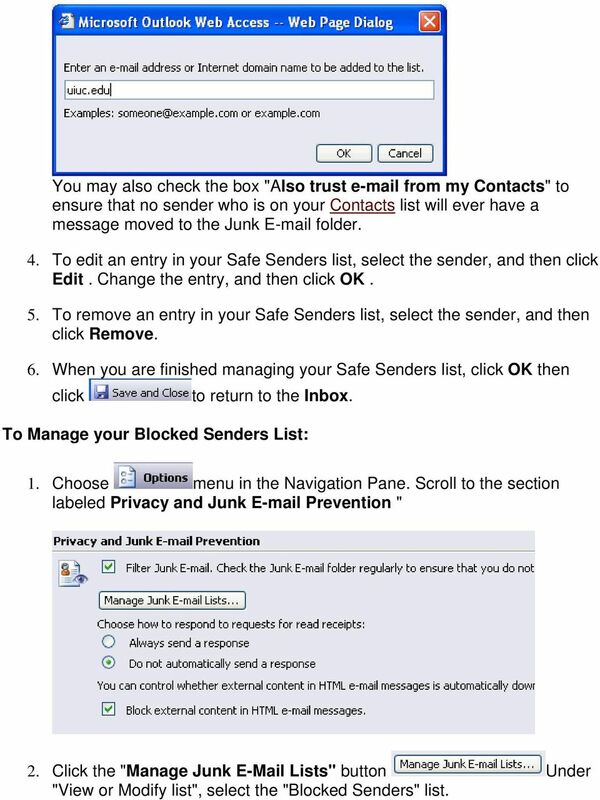 Manging Safe and Blocked Senders lists Outlook provides a means to ensure that from certain senders will never be filtered into the Junk folder. This is called the "Safe Senders List" Outlook also allows you to specifiy a list of senders whose messages will always go into the Junk folder. This is called the "Blocked Senders List" To Manage your Safe Senders List: 1. Choose menu in the Navigation Pane. Scroll to the section labeled Privacy and Junk Prevention "
15 2. 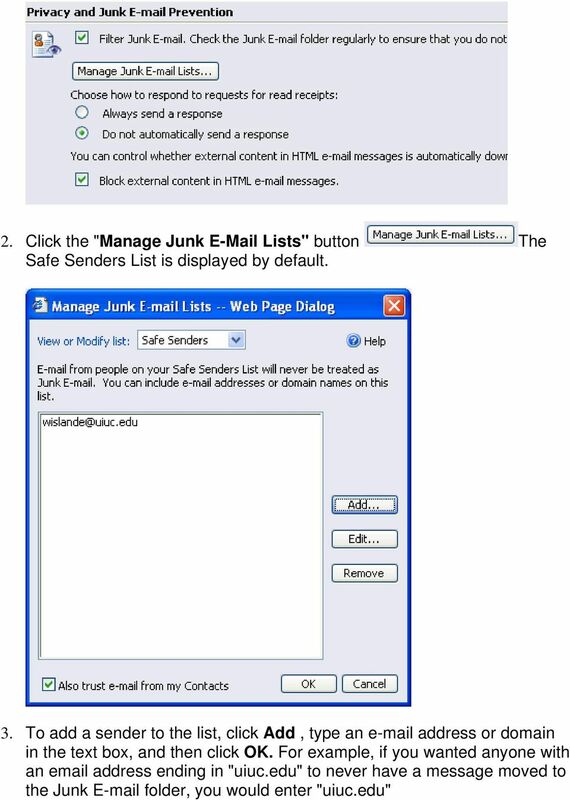 Click the "Manage Junk Lists" button The Safe Senders List is displayed by default. 3. 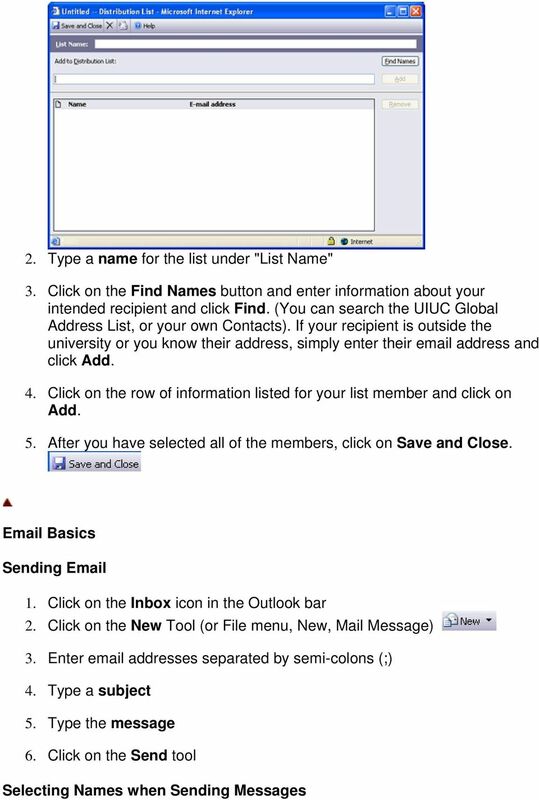 To add a sender to the list, click Add, type an address or domain in the text box, and then click OK. For example, if you wanted anyone with an address ending in "uiuc.edu" to never have a message moved to the Junk folder, you would enter "uiuc.edu"
16 You may also check the box "Also trust from my Contacts" to ensure that no sender who is on your Contacts list will ever have a message moved to the Junk folder. 4. To edit an entry in your Safe Senders list, select the sender, and then click Edit. Change the entry, and then click OK. 5. To remove an entry in your Safe Senders list, select the sender, and then click Remove. 6. 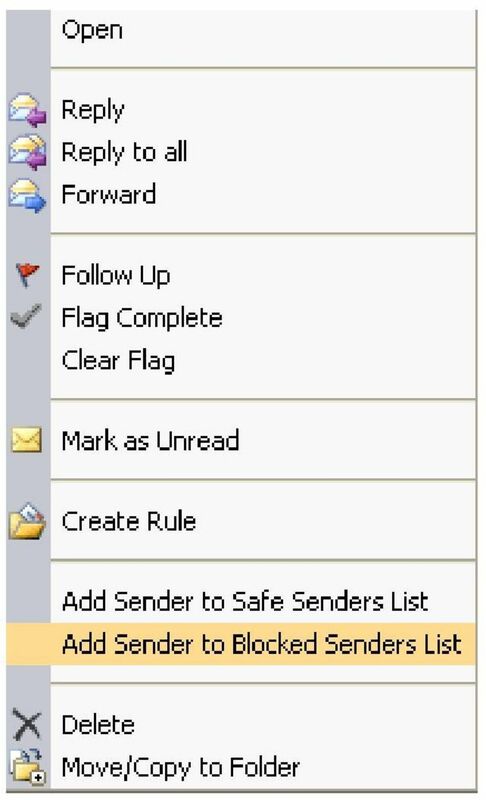 When you are finished managing your Safe Senders list, click OK then click to return to the Inbox. To Manage your Blocked Senders List: 1. Choose menu in the Navigation Pane. Scroll to the section labeled Privacy and Junk Prevention " 2. Click the "Manage Junk Lists" button Under "View or Modify list", select the "Blocked Senders" list. 17 3. To add a sender to the list, click Add, type an address or domain in the text box, and then click OK. 4. To edit an entry in your Blocked Senders list, select the sender, and then click Edit. Change the entry, and then click OK. 5. 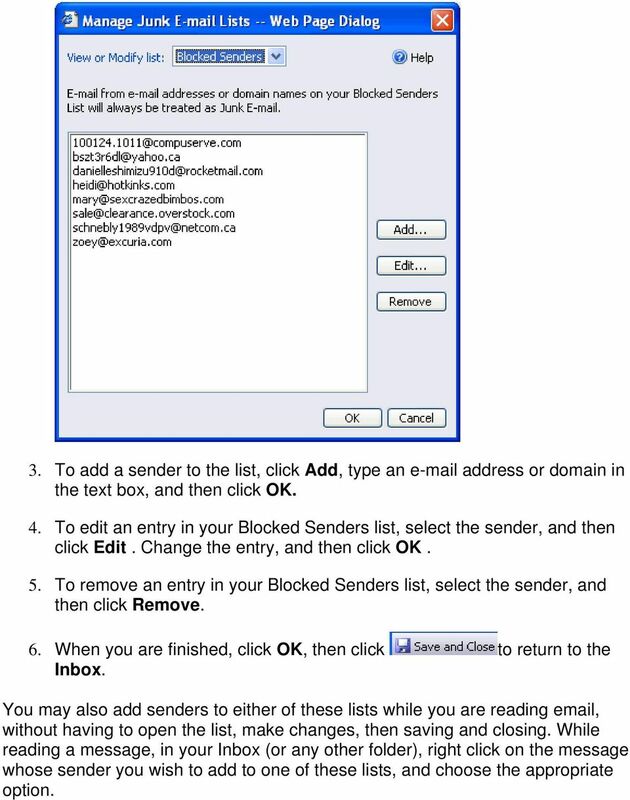 To remove an entry in your Blocked Senders list, select the sender, and then click Remove. 6. When you are finished, click OK, then click to return to the Inbox. You may also add senders to either of these lists while you are reading , without having to open the list, make changes, then saving and closing. While reading a message, in your Inbox (or any other folder), right click on the message whose sender you wish to add to one of these lists, and choose the appropriate option.